The purpose of obedience trials is to demonstrate the usefulness of the purebred dog as a companion of man, not merely the dog's ability to follow specified routines in the obedience ring. The basic objective is to produce dogs that have been trained to behave in the home, in public places and in the presence of other dogs in a manner that reflects credit on the sport of obedience. Training in competitive obedience will be beneficial for many other canine activities such as agility, field, and conformation. It's a great way to get to know your dog and learn something about yourself as well! At its finest, it can be compared to equestrian dressage with a team performing as one, moving smoothly together. All exhibitors in a class are required to perform the same exercises in substantially the same way so that the relative quality of the various performances may be compared and scored. There are 3 levels of classes: Novice (Companion Dog), Open (Companion Dog Excellent), Utility. A dog must pass each level 3 times under 2 different judges before moving up to the next level. The first level, Novice, results in your dog earning a Companion Dog (CD) title. The title actually describes what is expected of your dog: demonstrating the skills required of a good canine companion. The dog will have to heel both on and off leash at different speeds, come when called, stay (still and quietly!) with a group of other dogs when told, and stand for a simple physical exam. The CKC now offers a Novice C class for dogs that have earned at least a CD. This class is useful for handlers who would like to give their dogs more ring experience at a simpler level. It may also be good for the team like enjoys showing together but are not able to compete at the Open level. The second level, Open, results in your dog earning a Companion Dog Excellent (CDX) title. He must do many of the same exercises as in Novice, but off-leash and for longer periods. Additionally, there is a down in the middle of a recall, retrieving on level ground and over a jump and a broad jump. The group stays are peformed with the handler out of sight for longer periods of time. The final level results in a Utility Dog (UD) title. These are intended to judge the dog's ability to perform more utilitarian exercises. All exercises are performed off-leash. Under CKC rules, the dog must find a dropped glove, perform scent discrimination tasks, respond to hand signals, stop and stand in the middle of heeling and go across the ring, stop and jump as directed by the handler. Under AKC rules, the dropped glove exercise is replaced with a directed retrieve of a glove. In Canada, the dog earns a Obedience Trial Champion (OTCh) title when it earns its UD. Rally obedience is a relatively new sport that has been met with great enthusiasm in the US. It has often been referred to as a combination of traditional obedience and agility. Rally was originated by Charles "Bud" Kramer as sport that would demonstrate teamwork as well as obedience and training . The name comes from rally style car racing where a team uses directions to follow a course. In rally obedience, the team follows a course and executes exercises from a predefined set of exercises. Bud Kramer borrowed a concept from working dog teams (e.g. drug detection, police service, search and rescue) where "the handler's responsibility is to provide help and encouragement to the dog to keep the dog focused on the job at hand." Precision of movement is not a requirement for this type of work. Teamwork is more apparent in this type of work since the handler is allowed to interact with the dog as needed. The AKC recognized Rally as a titling event in January, 2005. In Canada, Rally is currently offered under the auspices of the Canadian Association of Rally Obedience and the CKC. Under all organizations, there are 3 levels - Novice, Advanced and Excellent. Similar to traditional obedience, teams must earn 3 legs under 2 different judges to title. Handlers are provided with course "maps" and may walk the course and ask questions of the judge as a group. When it's time to perform, the team enters the ring and sets themselves up to begin. The judge tells them "forward" and stays quiet as the team performs the course. Movement is not judged at the same degree of precision as in traditional obedience and there are no half point heeling deductions. The handler may repeat an exercise that was performed incorrectly before the next station is reached. An attempted exercise that is incompletely or incorrectly performed loses points but the performance is still considered to be qualifying if a minimum number of points are earned. Rally is a good way of introducing new dogs and/or handlers to the obedience ring. It can be a great way to get a new dog used to being in the ring. The handler can ensure that dog has a good experience by providing positive feedback. In a sense, it can be thought of as a training experience in the ring. Agility is a fast-paced and exciting sport that was modelled after horse show jumping. A dog and handler team work a course with a specified number of jumps, tunnels, contact equipment and weave poles in a specified period of time. The dogs perform the obstacles with instruction from the handler. The team may incur faults for errors such as knocking bars, missing contact areas or obstacles and taking too long. Agility is a good way to challenge a dog both mentally and physically. Dogs learn to respond to the handler's voice and body signals. Dogs can learn the obstacles by name and learn directional signals such as left, right, and go forward. The sport requires quick thinking and response by the handler to a potentially fast moving dog. Handlers are allowed to give an unlimited number of verbal or visual commands to their dogs but may not touch the dog or the equipment. Basic obedience skills are strongly recommended since the dog should be under control and must be able to sit, down and come when called. Agility is physically demanding and not every dog is built for this sport. The Agility Association of Canada (AAC), Canadian (CKC) and American Kennel Clubs (AKC) have classes that allow dogs to compete for titles by jumping a lower heights. 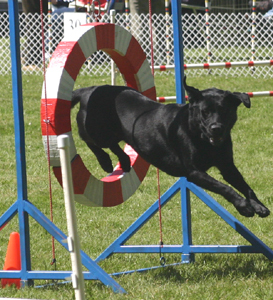 Some organizations, including the AAC allow non-purebred dogs to compete - a perfect opportunity for that rescue lab! Different organizations offer different types of classes. Currently, the CKC and AKC offer Standard and Jumpers with Weave classes at both standard and preferred (lower) jump heights. The AAC offers Standard and Games classes with standard, special and veterans height classes. USDAA and NADAC events are rarely offered in this area and are not described here. Therapy in this instance means therapy that the dog provides to humans, not for the dog! A therapy dog is different from a service dog that provides assistance to a disable person. There are two basic types of therapy work. One is animal assisted activity, sometimes referred to as "pet visitation". 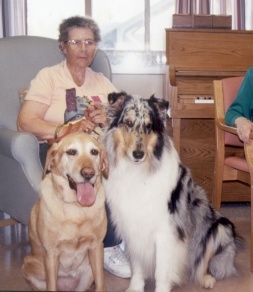 Friendly, well-behaved, clean and healthy dogs meet, greet and entertain patients in hospitals, retirement homes and other similar institutions. "Pet assisted therapy" involves the animal and handler working with a health care professional to assist patients with temporary or permanent disabilities to function better. Pet visitation is the simplest activity to become involved yet still offers a great deal of satisfaction to everyone involved. CKC tracking events are the competition form of canine search and rescue. These Tracking events provide training for dogs and their handlers to meet some human needs for tracking and finding lost humans or other animals, as well as, demonstrating the extremely high level of scent capability that dogs possess. The CKC's Tracking Tests allow dogs to demonstrate their natural ability to recognize and follow human scent. This vigorous outdoor activity is great for canine athletes. Unlike Agility and Obedience events that require a dog to qualify three times, a dog only needs to complete one track successfully to earn each title. A dog earns a TD by following a track 440 to 500 yards long with three to five changes of direction. The track is laid by a human tracklayer and is "aged" 30 minutes to two hours before the dog begins scenting. The goal is to use the scented track to locate an article left at the end of the trail by the tracklayer. The owner follows the dog on a long leash and can encourage the dog during the tracking test. The purpose of CKC draft tests is to demonstrate a dog's usefulness as a draft animal, reliable freighting companion and working. These tests were originally developed to demonstrate the traditional carting and weight-pulling skills of breeds such as Newfoundlands and Bernese Mountain Dogs.CKC draft dog tests are now open to all dogs of sufficient height and weight that are physically capable of performing the exercises. There are tests for individual dogs and for a brace (2 dogs working as a team). At the beginning level (Draft Dog), the test consists of 3 parts - Control, Carting and Field Work Exercises. 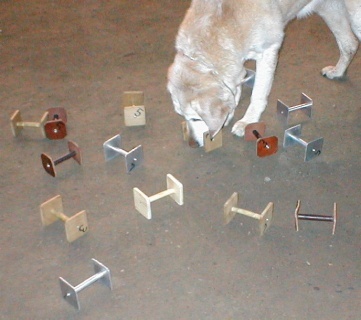 The Control Exercises consist of some basic obedience exercises (i.e. off-leash heeling, stand and down stays) to demonstrate the dog's ability to be a safe and obedient companion and worker. The Carting Exercises are performed with the dog in harness. The handler hitches the dogs to a cart or wagon, and the team then perform a series of carting manoeuvers including turns, a figure 8 and backing up to demonstrate his/her usefulness in hauling a wheeled vehicle safely and quietly over smooth terrain. The purpose of the Field Work Exercises is to demonstrate the dog's ability to pull a freight load over a moderate distance in cooperation with its handler. These exercises take place on natural terrain, with sloping land, boulders, high grass and/or trees forming natural obstacles. dog is also asked to pull a freight load over rougher terrain, which includes natural obstacles. The dog may be hitched to a cart or wagon or the harness may be attached directly to the load weighing approximately 18 kgs. The team move the load through simple manoeuvers over a variety of terrain including gentle hills over a distance of approximately 200 m. At the Excellent level, the Carting Exercises are performed with a 27 kg load. 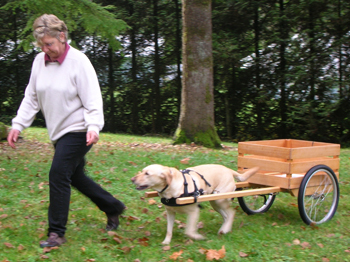 The handler must also direct the dog from behind the cart or wagon. The Field Work Exercise consists of a freight haul over rough terrain with a load of 18 to 27 kg. The course is 400 to 500 m and includes small hills and an obstacle such as a gate that requires help from the handler. Backpacking Exercises are also included at the Excellent level, demonstrating the ability of the dog to function as a pack animal. The dog must carry a 2 day supply of dog food and other items up to 1/6 of the dog's weight up to a maximum of 11 kg. Once the dog is packed, the team travel an 800 m course over rough terrain, that could include fallen trees, fordable streams and steep hills. The team will also enounter a distraction in the form of another dog, on leash with handler. The purpose of the national Canine Good Neighbour Program is to ensure that one of our most favoured companions, the dog, is accepted as a valued member of our communities right across the country. Canine Good Neighbours can be counted on to present good manners at home, in public places and in the presence of other dogs. The training program embraces both purebred and mixed-breed dogs and is fun, rewarding, and useful. It encourages owners to have a better and richer relationship with their dogs. The program also enhances community awareness of responsible dog ownership and the numerous benefits associated with dog ownership. 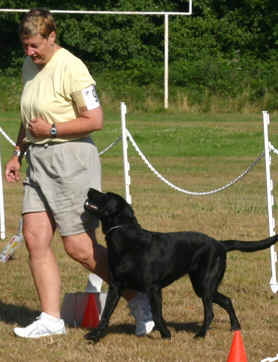 The handler may speak to and encourage the dog throughout each exercise except the out of sight test.